Many people have asked me since seeing the Instagram I posted on Tuesday and the answer is: she is everything you want her to be and more; a very pleasant and gracious human being. 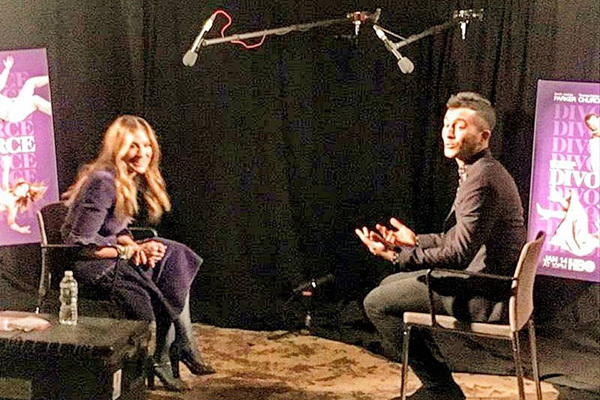 In a departure from interviewing music artists, I sat across from actress Sarah Jessica Parker in HBO’s New York headquarters for a junket-style interview. She was promoting the second season of her series, “Divorce.” Our chat was filmed for DISH Studio on DISH Network and will air at a later date. SJP is without question one of the more prominent actors I’ve interviewed and this was certainly something on my mind as I prepared (mostly by binging season one; by the way, the show is really good and surprisingly laugh-out-loud funny at times). I ultimately always remind myself that I’m not a rookie, that we all put our pants on the same way and that I’ll rise to the occasion. Any trepidation that lingered after the pep talk immediately melted away after watching Parker enter our room. The Emmy winner was a sphere of energy, smiling and shaking hands with employees of HBO and the production company handling the junket, regardless of if she had previously met them or not. I asked her about this to start our interview; I mean, just Sunday SJP was in Los Angeles for the Golden Globes. She flies back to snowy and cold New York, she has a family to take care of and she has to return to HBO for a press run about this series. I asked if it was OK to assume that she clearly must love the show. While she obliged, Parker also noted that it is a little more than just a passion project: any time she comes back to HBO headquarters, it feels like home. She has so much history here, so many good memories, many of which come flooding back. Parker looked and sounded genuinely grateful. She wasn’t bitter about her travel schedule, her obligations or any notion that her past should be shunned (some entertainers shy away from talking about previous work that was successful for fear that they’ll never be able to move past it). But not SJP; she was thankful for her past and happy with her present. I myself felt fortunate to witness it because her gratitude was infectious; a nice lesson as we begin the year anew.